Pierre Parenteau from SampleScience has been researching and working hard to develop a set of sounds for hip-hop music production called Da Vinyl Box. This is a free collection of samples that were taken from various audio recordings and public domain movies. Once the audio parts were gathered, Pierre has transformed them into high-quality audio loops and has split them according to different BPM rates. Then, he prepared them to be used as hip hop samples. The audio set released by SampleScience contains samples, beats and loops. It is free to use for anyone who wants to produce hip hop music, including commercial projects. All you need to do to begin using the samples is to integrate them into a sampler or DAW. In the audio package, the files are grouped into seven folders: breakbeats, music loops, bass loops, percussion, one-shot, FX and vocals. 263 audio samples and loops are available in the set. The majority of these loops include data about tempo and key information, and this can be great for anyone who wants to use them in a project or more. What Pierre has managed to create is a set of sounds of an incredibly high quality despite the fact that downloading the pack is free of charge. The user will be amazed of the quality and diversity of sounds that can be found in the public domain. If you download the pack, you will get numerous drum loops, vinyl noise recordings, bass riffs, some amazing sound effects and cool percussive hits. Da Vinyl Box can be downloaded from the official SampleScience website. The pack is free, but you are asked if you want to support the site by making a donation. You will receive the link to download the pack by email. Another great thing from SampleScience is the virtual instrument called Famicom that sounds like the old gaming console with the same name. This console is popularly known as NES (Nintendo Entertainment System). The instrument is commercial, but you can download a free version from Samples containing two free presets that are also available in the commercial version. Modern Samples, the online place to find high quality drum samples has just launched their latest offering of over 200 lofi samples called Lo-Fi Drums Collection. These sounds were professionally mixed and are ready for use in Trap, Hip Hop and modern pop music. The original samples cam from drum machinecs and live recordings and were processed from there. Inside the kit you get 13 Claps, 20 Crashes & Splashes, 32 Effected, 43 kicks, 43 percs, 23 perch low, and 35 snare samples. All these samples were processed using the highest quality plugins, analog gear and “secret-sauce” as they would say. BONUS LOOPS – On top of the amazing lo-fi sounds that come inside this pack, you also get access to over 30 really high quality lo-fi loops. These loops were added as a bonus add-on and they sound absolutely incredible. In fact, the entire kit sounds great even though they are situational. I would still recommend them for any producer/engineer to add them to their collection. Check out the walkthrough video of the kit. 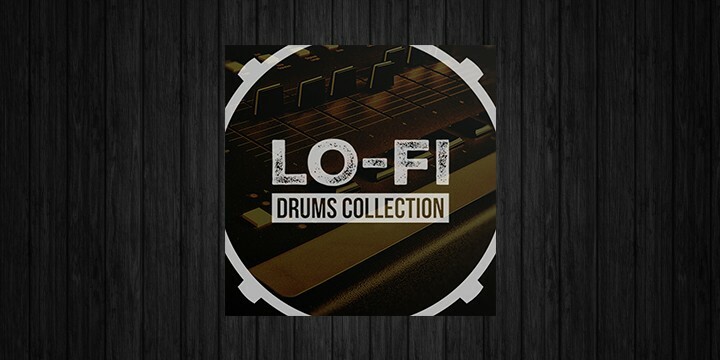 Lo-fi Drums Collection contains 209 one shots & 33 loops and can be downloaded via Modern Samples. The lo-fi samples are all 24 bit, 44.1 kHz and are 100% royalty free. Aphelion V1.5 Free By Particular-Sound. The Best Cinematic GUI Of Our Time? Enjoy free cinematic audio content for Native Instruments Kontakt and other WAV samplers. 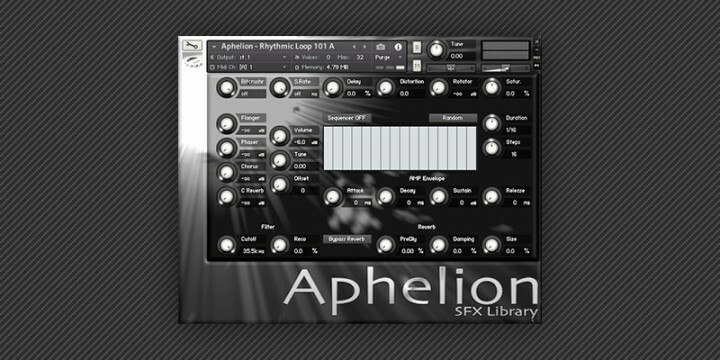 With Aphelion V1.5 FREE by Particular-Sound, you will have access to a library that contains loops in 24 bit .WAV format has nine instrument patches and hosts 108 audio samples to use. The NI Kontakt patches have been built around a custom designed user interface that gives you good control over the sounds. While it might not be the most user-friendly interface to work with, it more than makes up for it in functionality. The GUI allows for control over various modules such as the step sequencer, amplitude envelope, filters and built-in effects like reverb and flanging. The great thing is you can make your adjustments within the interface and can avoid going to the instrument editor. Check Out: Cinematic Sound Effects By Generdyn For Free! While Aphelion V1.5 Free is great, it doesn’t come without restriction. They have added a time limit of fifteen minutes. So, if you just want to play around it’s okay but for only 34.99 you can unlock the full version. This will allow you to unlock all of the WAV files so that it can be used with any virtual instrument or DAW system. Great for non-Kontakt users as you will be able to use these audio files with other applications. The full version also adds more depth to the library by adding a variety of build-up sequences, impacts and swooshes that work perfectly with modern electronica and cinematic soundtracks. They also beef up your sound bank to almost four gigabytes of audio content. Download for free by visiting the product page by clicking the link below. Once there, scroll down the page until you see the Aphelion V1.5 Free section. After you are at the free section, you can start your download by going through the link on the sidebar. Check out the complete copy of The Aphelion Sound Bank here. Aphelion V1.5 Frev is a free download via Particular-Sound. It contains 108, audio samples, nine instrument patches to use for the NI Kontakt. It comes with a zip archive, and the download size is 207MB. Loops De La Creme, the online music sample library store, has announced it is releasing a Surprise Sample Pack Version 2. SSP2 is a free to download sample pack featuring audio loops, instrumental samples, and patches for the NI Kontakt Player. It is classified as donationware – free to download with no minimum donation). This sample pack is unique in that users don’t know the contents of the sample pack before downloading it. But fear not, because BPB is here to spill the beans and give you the lowdown on exactly what is inside Surprise Sample Pack 2! Spoiler Alert – If you would prefer the contents to be a surprise then skip reading and go straight to Loops Da Creme Bandcamp and download this amazing sample pack now. For those of you who have decided to read on, here are the juicy details. The contents of this Surprise Sample Pack 2 are sorted into three separate categories – one-shot samples, loops and KI (Kontakt Instrument) patches. The one-shot files are standard WAV format (24-bit, 48 KHZ), and they feature a diverse collection of sounds ranging from cool electronic perc hits to complex sound effects. There is a total of 49 one-shot samples included in Surprise Pack 2. The loop section of the sample pack is organized into three distinct groups – progressive tribal sounds, vintage drums and organic sound textures. There are 14 loops in total, each with its own unique and high-quality sound. The tribal loops are particularly outstanding, and I highly recommend them – I will most certainly be using them myself in the future! Finally, we have the Kontakt Instrument section of the Surprise Sample Pack 2. This is a powerful sub bass patch that is perfect for lovers of hip-hop or other similar music with a strong emphasis on deep bass. The sub bass in based on a sine wave and gives users the options to layer with other sounds using just one click of the mouse. 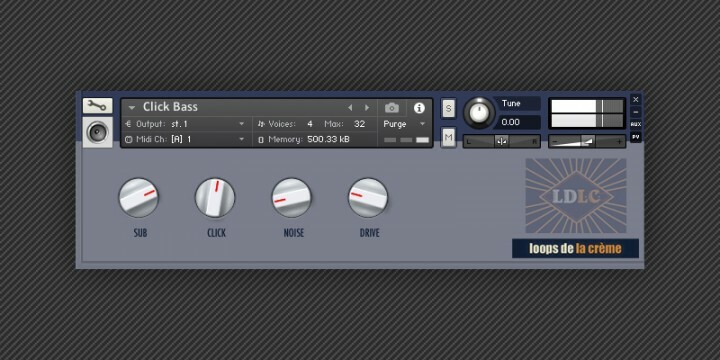 You can saturate the bass notes as well in the Kontakt player with the simple custom user interface. In summary, the Surprise Sample Pack 2 is a wonderful collection of sounds. The fact that it can be downloaded completely for free is a bonus (although donations are recommended because it is an extremely high-quality group of sounds). You can download it from the Bandcamp page linked below, and I highly recommend to do so if you are a music enthusiast. There are numerous other worthwhile freebies on the Loops De La Creme website including the previous iteration of this sample pack that was released a while ago. You can now grab 30 demo presets for free that have just been released by The Unfinished! 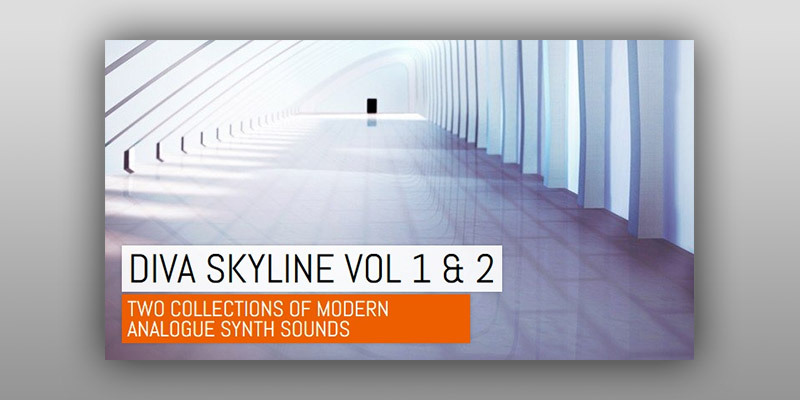 These presets are available as a set from his Diva Skyline Volumes 1 and two sound banks and can be used with the Diva virtual analogue synthesizer by U-He. You can use the presets for modern electronic sounds with an analogue style for best results, in fact; this is what The Unfinished was aiming at. This is because they are perfect for synth-heavy film scores as well as modern retro-electronica used in glo-fi and chilwave. All the presets are pretty awesome and can be previewed at The Unfinished’s website. You will as well get some walkthrough videos about both sound banks. The demo packs are in separate product pages, which can be a bit confusing, but the links to either sound bank can be found below. Scroll down either product page to the last paragraph to find the sound banks themselves. Once you locate the presets you would like to try, just click on the download links below them and that’s it, there’s no registration or email subscription required. If you like what you hear, you might want to purchase the full version of the U-He Diva presets, which cost $19.99 (+VAT) for each sound bank. Each sound bank has 128 presets inside which is much more than the 30 presets you get from the free demo packs. There’s so much more stuff in The Unfinished’s website you can buy, plus they all have previews you can listen to before you make the purchase. Be sure also to check out the freebies page for more free stuff to download and enjoy while you’re there. There is so much free stuff to check out. You will also find a video below which will show you what to expect from the first sound bank and how you can use it. These 30 presets are available for free download from The Unfinished (ZIP containing 30 presets for Uhe). 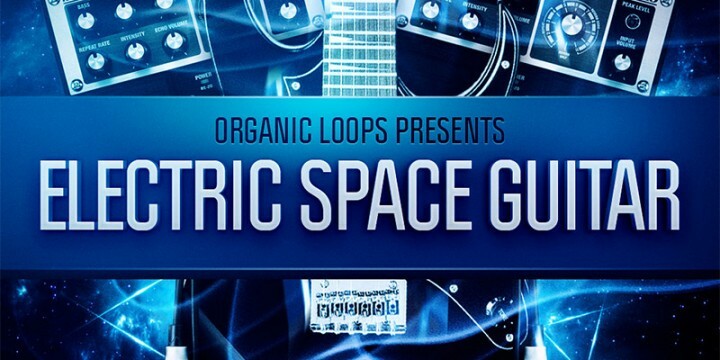 Newly available from Loopmasters, the Electric Space Guitars sample library is available for a low cost and features a wide variety of spaced out guitar riffs created exclusively for the Organic Loops library. This promotional package features a sampling of 84 different loops from the full version. The available loops consist of 21 unique guitar riffs, each of which has four separate sound settings. Combining all riffs and sound options results in a total of 84 different loops. For a sampler, this is a sizable package. Additionally, the sample pack includes a discount code for the complete version, if you want to expand the amount of loops and effects in your Electric Space Guitars library. In this version of Electric Space Guitars, all loops are given a tempo of 100 beats per minute. However, if you purchase the complete version, you can adjust the beats per minute between 75 and 130. I’ve been satisfied with the sound quality of this sample pack and recommend using a sampler to adjust timing and slice the samples. Shortcircuit 1 is an excellent freeware product for this kind of work. The full version obviously offers a much larger sample library with a wider variety of options, but overall having four sound settings for each riff in the sampler version makes it well worth the download. Copyright © 2019 Reel 2 Reel Music | Theme by SiteOrigin.